The Boflex® Aerobic Sport Floor, also an excellent multi-purpose floor, is the result of over 20 years of testing to perfect the ultimate in a pre-finished, high performance hardwood floor system. The Boflex® floor is produced by Boen Bruk A/S of Norway, and is distributed exclusively in North America by Centaur. It has been Europe's premier hardwood sport floor for the past 8 years. Utilizing a patented resilient foam channel under structure, Boflex created a floor system with progressive resilience for safety, performance and comfort. The shock absorption channels allow even small children or light weight athletes to gain immediate resilience. Boflex is engineered to withstand heavy loads as the foam channels are recessed into the backside of the hardwood base construction. This eliminates the chance of the foam being damaged or crushed. Boflex warrants the resilience for the life of your floor. The Boflex Sport Floor was designed with safety and performance as its number one criteria. BOFLEX has been tested to the D.I.N. Standard 18032, Part II, which is recognized as the worldwide standard for ensuring the highest possible standard in athletic performance, safety and durability. This chart clearly shows Boflex exceeds the D.I.N. Standard in all six critical areas. Boflex is more than a beautiful hardwood floor, it is a stable solid investment for you and you participants. Due to its cross layer construction, Boflex is 70% more dimensionally stable than traditional solid hardwood floors. This means minimal unsightly gaps. Because Boflex is pre-finished, most installations are completed in one day, without the dust, odors and inconvenience to user groups. Boflex Sports Floors have been installed throughout the USA and Canada. Boflex aerobic floors are now in use in clubs operated by the major licensing chains; Gold's Gym, World Gym, Powerhouse, 24 Hour Fitness, just to name a few. Boflex is also the recommended aerobic floor for the Cory Everson Women's Only chain. In addition, both Ms. Fitness USA and Ms. 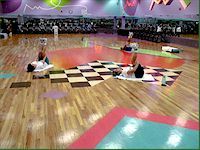 Fitness World competitions used Boflex® Floors. GUARANTEE: The Boflex Sport Floor System has been tested with 45,000 lb. load without the loss of resiliency to the foam channels or breakdown of the double tongue and groove connection joint. These factors allow us to offer a Five Year Warranty on its Boflex floor. MAINTENANCE: The maintenance simple daily vacuuming or dry mopping is all that is required to keep your floor looking beautiful. You will need to damp mop (wring out completely!) every week or two to remove dirt and perspiration. The Boflex floor six coats of factory applied finish which provides a hard wear layer and safe traction coating. NOTE: Never allow water to stand on a wood floor.